E*Trade Financial or E*Trade Securities is one of the leading online discount brokerage based in United States which allows non-US and international persons worldwide to open an investment or brokerage trading account to buy or sell stocks, shares, bonds, options, mutual funds, and exchange-traded funds. The unique feature of the ETrade investment account is its “complete” feature, which also provides customers with checking or current account facilities such as debit cards and cheque books. With the complete all-in-one convenient feature of the E*Trade investment trading account, many non-US alien person has used ETrade as the alternative to owning a full feature bank account in United States, as getting a ‘true’ bank account in USA is becoming increasingly hard if not impossible at all. E*Trade account serves as an easier alternative to get a US-based checking account with debit card and check book facilities. Best of all, withdrawal of money via ATM carries no fee, and withdrawal in local currency incur on mark-to-market exchange rate, thus making E-Trade account attractive for webmasters, publishers, bloggers, merchants, or product sellers from outside of US who need to receive US dollars, especially in PayPal account and want to withdraw the money in their home country local currency with low or no cost or fee. PayPal has a notoriously high fee charged to the exchange rate. Thus, it’s a good wise workaround and recommended to withdraw PayPal balance into E*Trade cash account (comes with any trading account), and then subsequently can be withdrew via PLUS and InterLink networked ATMs worldwide. Users can use the VISA debit card to do online or offline purchase directly too, or issue check for payment. Click on Bank Accounts under “Financial Information” section. Select United States in the “Country” drop down list. Enter ETRADE Clearing as the “Bank Name”. Select “Account Type” as Checking by clicking on the radio button. Enter 056073573 as the “Routing Number”. Then enter and re-enter your eight-digit E*TRADE Securities account number in the 2 “Account Number” fields. PayPal users can now withdraw money from PayPal account to the US bank account. However, to add funds from the bank account to PayPal account, or to fund the payment, the US bank account needed to be confirmed and verified. 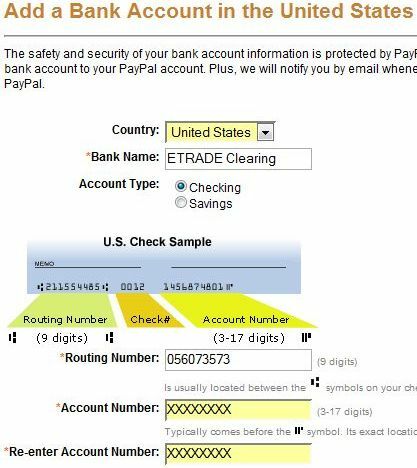 For this purpose, PayPal sends two small deposits with random value ranging from $0.01 USD to $0.99 USD into the added E*TRADE account. The credits will appear in E*Trade account Transaction History which can be viewed online within 2-3 business days. So after 2 or 3 days, login to E*Trade online banking portal, then locate the credit transactions which has something like “ACHCredit PPDPAYPAL”. Then, to complete the bank account confirmation process, log in to PayPal account, click Profile, click the Bank Accounts link, select the bank account and click Confirm. Enter the two deposit amounts on “PayPal’s Confirm Bank Account” page and click Submit. Update: Non-US alien may not be able to get checking account from E Trade.